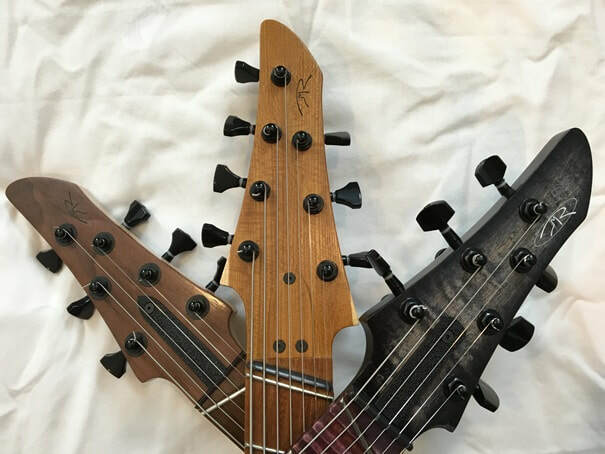 Jayemar Guitars are hand-crafted, multi-scale, extended-range electric guitars and basses, and a variety of pickups wound in-house come standard on every instrument. However, there is no "standard" Jayemar guitar. Two models serve as a platform for shape and general aesthetic - the Iris and the Alma - but the combination of woods, contours, string count, electronics, and appointments will always result in a beautiful, one-of-a-kind instrument. When mixing and matching available options, you're only limited by your imagination. Scroll through the options in the expandable menus on the IRIS GUITAR and ALMA GUITAR pages, find inspiration in the GALLERY, check out what's ON THE BENCH or AVAILABLE NOW! to purchase, or contact me to COMMISSION A GUITAR to receive a comprehensive options form and start dreaming about the possibilities of your new guitar today!